Ever wonder how you can enhance or simplify your customer’s experience on your website? to your Terms and Conditions. For the many companies who want to simplify the browsing of their site and wish to show their customer’s that their Terms and Conditions have been reviewed, you may inquire by clicking below. If there are any websites or mobile applications you need reviewed, Click the button below to access the request form and we will have the site reviewed within 48 hours. TermSAFE takes the guess work out of the daunting task of reading the Terms and Conditions on your most visited websites! TermSAFE reviews website Terms and Conditions and notes any sections, if any, that the user might want to read before agreeing to them. TermSAFE is focused on improving the users experience, improving the business’s customer service and ultimately strengthening the relationship between the two. The TermSAFE mission is to help website and app users improve their confidence and comfort level before agreeing to Terms and Conditions. We realize that most people do not read Terms and Conditions, or any service agreements, and click AGREE on just blind faith. Many users have trepidation and discomfort over potential liabilities and costs, but click AGREE anyway. Look for this shield on websites you’re browsing. This tells you that the site's Terms and Conditions have been reviewed by us. All Terms and Conditions are reviewed by a qualified legal professional. 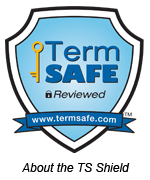 When you see the TermSAFE reviewed shield, you can browse that site with confidence.